Simply make a call in order to activate your Talk Abroad™ International SIM card. Your service is valid for 12 months from the day of activation. 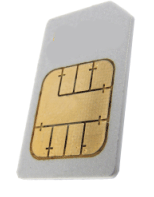 Recharging your SIM card (adding talk time), extends the validity for another 12 months from the day you add the credit. Please note that while the service does work in North America (in areas with GSM coverage), the service is intended for use overseas and therefore, placing a call from your handset in North America is expensive. You can add talk time at any time - together with your purchase as well as prior to and during your trip. Choose the "Auto-credit topup" option during checkout to enable your credit to be recharged automatically every time your credit drops below $10.00. Alternatively, you can add $29 to your account at any time while traveling, instantly, by dialing *161# send from your handset. Additional call credit is $29 for roughly 42 minutes of talk time (for most popular destinations). Each time you add call credit or “recharge” your account, you will extend your service life for an additional 12 months from the date of the recharge. Previous call credit will accumulate to your new call credit. You can send and receive SMS text messages from your Talk Abroad® international cell phone to and from your UK number. However, we nor any carrier, can be responsible nor guarantee that you will always be able to send and receive SMS messages in all circumstances and in all countries. SMS text messages are free to receive and are $0.60 to send, regardless of the country.